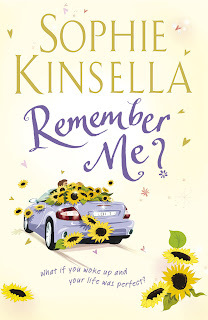 The Sweet Bookshelf: Remember Me? In this latest offering Lexi wakes up in hospital thinking that it is still 2004 and she is going out with Loser Dave, has wonky teeth, loads of friends and works in a low paid job in a carpet company. In fact it is 2007 and she is married to a gorgeous multi-millionaire, has perfect teeth, lives in a huge penthouse overlooking the Thames and has a high-flying job as a Director (oh, and she is the boss-from-hell), only Lexi can't remember a thing about it. The story follows Lexi as she tries to fit in with her new life and fill in the gaps as to how she ended up where she did (and how she managed to alienate all her friends in the process). I am a huge fan of Sophie Kinsella - she is an author where I am never let down. I always look forward to her books coming out as they are guaranteed feel-good books. Remember Me doesn't disappoint. It's funny, witty, and I love the the hero's Sophie Kinsella conjures up. They are always so YUIMMY! There is a lot of the "f" word, and infidelity in this book...but that being said, I still really enjoyed it. TWO THUMBS UP!